Vegan Nutritionista's Vegan Bytes #29-- Are You Afraid to Put Yourself Out There? Vegan Bytes #29: Are You Afraid to Put Yourself Out There? *Question: "I lost 210 pounds on a vegan diet!" *Question: "How can men gain weight on a vegan diet?" If you’re remotely connected to the vegan (or political) world, you probably heard that Chelsea Clinton just had a -mostly- vegan wedding. It spawned countless articles and blogs, all speculating on who catered it, what the guests ate, what the cake tasted like, and more. And, for me, it couldn’t have come at a better time. See, a month after Chelsea got married, I got married, and… you guessed it, we had a vegan reception. I loved seeing all the stories arguing both sides of the argument; should you stick to your ideals and serve what you believe in, or should you bend and add grass-fed beef or something else to your menu “for your guests”? I could only hope that my family members and friends would read about her wedding and stop worrying that ours was going to be a tofu fest. Well, for me and my fiancé/husband, “for our guests” we wanted to serve vegan food. To us, it would have been hypocritical to add anything else to the menu for countless reasons. 1. We are ethical vegans and don’t believe animals should be used for human food. 2. We believe that vegan food (especially the kind we served) is far healthier than non-vegan food, so we think we are doing our guests a service by serving it. 3. Though we try hard not to be self-righteous about our beliefs, we believe very strongly in how we eat, probably as strongly as some feel about religion. Guests wouldn’t expect Muslims to serve pork at their wedding reception, so should they really expect vegans to serve it either? Now, this doesn’t mean that we judge vegans who choose not to serve exclusively vegan food, because we understand that everyone is different. We know that sometimes family situations or catering availability or religious or political affiliation can get in the way. Granted, we realized that we were really putting ourselves (and vegan food) out there for criticism, but we couldn't resist. We loved having the chance to show our closest friends and family members that vegans don’t just eat salads and that vegan food can not only be totally filling, but totally delicious. After all, how many weddings have you gone to where you left thinking, “That food was outstanding!" Most of the time the food is forgettable, at best. So why should people make such a big deal of it? And, at the end of the day, we figured that if they hated going for one meal without meat so much, they could stop and get wings on the way home. Or they could fill up before they came. The great thing is that, nowadays, it’s become extremely easy to find an outstanding vegetarian/vegan caterer who can prepare food that will knock the socks off your guests. With celebrities like Chelsea Clinton and Alicia Silverstone opening the world’s eyes to the possibilities of vegan food, more and more people will see it as an accepted food, even for fancy occasions. And, the more of us who request it, the more the supply of vegetarian caterers will increase. We found the best vegan caterer in the area and lined up a delicious, vegetable-centric dinner for people to try at our wedding. And, we did our best to ignore the negative comments that went beyond the normal concerns such as, “We’ll get a pig spit roast in the parking lot,” and “If you were coming to my wedding, I would make sure you had vegan food to eat.” Those are direct quotes. However, I choose not to dwell on them. In both cases, the person admitted they were joking. Well, guess what... we did get the reaction we hoped for, and more. We had lots and lots of people tell us how good everything was, and we even heard through the grapevine about several skeptical people who gave the standard quote, "Oh wow, this is actually really good." Evidently, a week after the reception, some of our guests were still talking about how delicious the food was. Score! Kit Wood from Gail's Vegetarian Catering in Maryland provided our local, organic, vegan meal for the evening. We did have a little tofu on the menu, but it was hidden in "no meatball" as an appetizer. We also had spiked gazpacho shooters and decadent zucchini cakes for passed appetizers. Then, we had an heirloom tomato salad with a balsamic drizzle for our salad. The blueberry butter on whole-grain baguettes was a huge hit. For the main course, we had "no-crab" corn cakes, black bean salad, lemon-artichoke pasta, grilled bourbon peaches, steamed green beans and roasted beets. Oh, yum! The crab cakes and peaches were crowd favorites. And, let's not forget the cake. We got ours from Kamber Sherrod at Sticky Fingers bakery in D.C., and it was amazing. Not only was it incredibly beautiful, with light green "buttercream" frosting and gorgeous purple sugar flowers all over it, but it was delicious. We had vanilla layers and a chocolate layer, each with different types of fresh fruit filling. In conclusion, I encourage you to hold strong to your beliefs and help others to experience something different, even if for one meal of their lives. And, you never know, you might get one or two people for whom one meal changes their lives. If you had a vegan/vegetarian wedding, we'd love to hear your story too. Shares yours here. 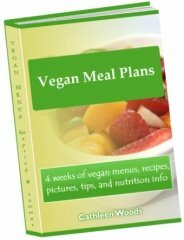 You can also find tips on vegan wedding menu ideas. I lost 210 pounds on a vegan diet!" 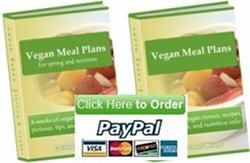 Question: We get so many questions about vegan weight loss on Vegan Nutritionista, and many times my answer is the same; "eat plenty of vegetables, whole grains, beans, and fruits, and add in some sea vegetables and nuts/seeds. Drink lots of water and exercise moderately." That can get old to hear, but at least I'm consistent, right? La Dawn's Story: I've lost 210 pounds on a vegan diet! In 2005, I was a 40-year old 380 pound woman dealing with a terminal illness, however, through change and prayer, I have beaten the odds and lived longer than the doctors ever thought I would. In the process, I've lost more than 200 pounds. I’m in the best shape of my life and smaller than I was in high school. This strict regime that I’ve created has dramatically improved my quality of life, re-energized the immune system and has given me a renewed spirit with the ability to get on with living. See La Dawn's amazing before and after picture here. "How can men gain weight on a vegan diet?" Second of all, this is a great question. 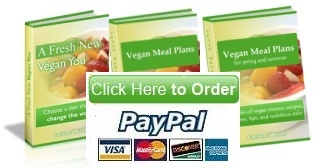 Many people struggle with losing weight and find the vegan lifestyle as a great answer to their problems. However, sometimes a thin person might struggle with the opposite problem and might need to gain weight. I know this is a sensitive topic for men too, who often want to maintain a strong physique and not be too thin. If your husband has a high metabolism, he will burn all those calories off much quicker, so he will simply need to eat more often. Every couple hours, when he gets hungry, he should have a snack. This is also where his weight lifting will come in handy. As a male, he needs good portions of whole grains and beans, as well as leafy greens, to ensure he has plenty of energy for building muscle. It's the season for fresh apples, and I can think of nothing better than a healthful but delicious raw vegan apple pie for this month's recipe. This recipe is adapted from several great pie recipes I found on the internet, and it turns out perfectly. You can take it to a pot luck and charm everyone with it, or just keep it for your household. You don't need to turn on your oven to make this pie, so it's great when apples come in season but the heat hasn't left the kitchen yet. Also, don't be scared of the extra steps; they are exceedingly easy and quick. Read how to put your pie together here.